Social networking has quickly become the new "in" thing to do in cyberspace. Whether you're using it to organize your social life or you're trying to expand your reach as an author, social networking can help you reach those goals because it allows you to reach an audience you might not otherwise reach. Plus, if you're using it to promote your business, the interpersonal nature of social networking sites gives you the chance to interact with a much more personal voice. Another way to manage your time is to connect your networking profiles together. In this video, I'm going to show you how to save yourself a significant amount of time by connecting your Twitter account to your Facebook and LinkedIn profiles. 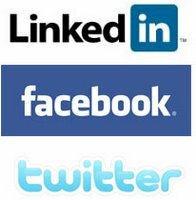 Have your login information for both Twitter and Facebook handy. Search in the top search bar for the Twitter Application. Add the application to your account. Then, allow and authorize access for Twitter and Facebook. Enter your Twitter login information and select the option to update your Facebook status. Choose your preferred settings and click "Allow." Click on the Twitter icon below the "Share an update" box. A pop-up window will ask if you want to allow access to Twitter - allow and authorize. If you're logged into Twitter already, it'll connect right away. If not, you'll have to enter your login information. Complete the process by selecting "Save Settings." For people using Twitter very differently than LinkedIn, connecting Twitter to LinkedIn is not a good idea..